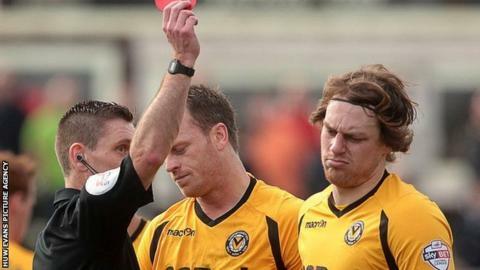 Newport County are awaiting a response from the Football Association over their report of referee Steve Bratt's performance during the Portsmouth game. County lost 2-1 and finished with nine men after Adam Chapman and Darcy Blake were sent off. Manager Justin Edinburgh is still not happy with some of Mr Bratt's decisions. "I think he was certainly out of his depth and it was a very poor performance," Edinburgh said. "I think he got caught up in it being Portsmouth and overawed about his decisions, inciting the Portsmouth crowd. "We have put a report in about it because, for me, I think we've seen the standard has been better this season." Midfielder Chapman was shown a straight red card for a two-footed lunge, while defender Blake was also sent off late on following a second booking. Edinburgh says he has no issue with Chapman's red card but he was unhappy with Blake's second yellow card and several other incidents during the match. The County manager revealed Chapman had been fined for the reckless challenge on Danny Hollands during the first half against Portsmouth. "He accepts it was a poor decision," Edinburgh added. "It's not the first time we've seen that on a football field. You can't go around doing that. "And that's certainly out of context with what Adam's about. "He's been dealt with and been fined and accepts the punishment. "The biggest punishment for him is that he misses the next three games and we went down to 10 men early in a game we certainly could have got something out of."